The "type specimen" of Stegoceras was named by the famous Canadian paleontologist Lawrence Lambe in 1902, following its discovery in the Dinosaur Provincial Park formation of Alberta, Canada. 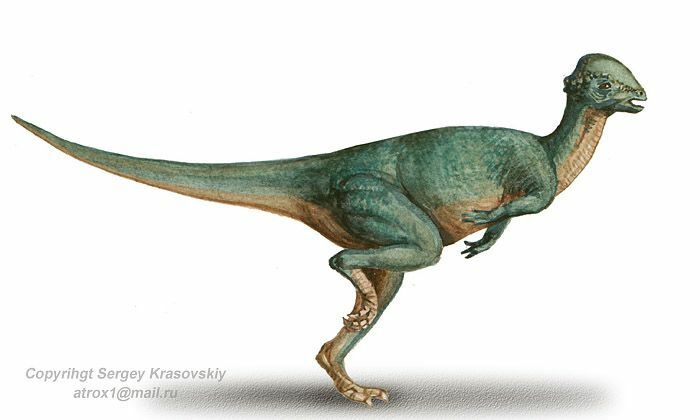 For a few decades, this unusual dinosaur was believed to be a close relative of Troodon (which was actually a saurischian rather than an ornithischian dinosaur, and thus resided on an entirely different branch of the dinosaur family tree), until the discovery of further pachycephalosaur genera made its provenance clear. For better or for worse, Stegoceras is the standard by which all subsequent pachycephalosaurs have been judged--which is not necessarily a good thing, considering how much confusion still exists about the behavior and growth stages of these dinosaurs. For example, the presumed pachycephalosaurs Dracorex and Stygimoloch may have been either juvenile, or unusually aged adults, of the well-known genus Pachycephalosaurus-- and at least two fossil specimens that were initially assigned to Stegoceras have since been promoted to their own genera, Colepiocephale (Greek for "knucklehead") and Hanssuesia (named after the Austrian scientist Hans Suess).